U.S. cyber attack on Venezuela? We are standing by the most peaceful border [Sweden & Finland] in the world. Here people have lived everyday life in peace more than two hundred years. Finland has lived in peace with Russia almost 75 years. Peace is achieved and preserved as a result of determined cooperation and wise diplomacy. Today there are 10,000 soldiers at this border. Why? They don't make the border more peaceful, they are bringing the war here. Parts of these soldiers come far away from USA and Great Britain. To the US and British soldiers we want to say: We don't want Your wars. Go home to Your leaders and tell them that in Finland and Sweden the people want to go on living in peace. Peace is built by friendship between peoples, by cooperation and by finding solutions to conflicts by negotiation in a spirit of mutual respect. You may be our friends, but if You bring war to us, You become our enemies. Take away Your tanks and Your projectiles from our territories! We don't want Your wars, we want our peace. We don't want Your noise, we want silence. We don't want Your pollution which Your tanks and fighters spit into our nature – we want to keep the nature clean and fresh. The war industry and the war exercises pollute massively, but Pentagon has demanded it is not taken into account in the climate agreements. If we really want to stop the global warming, we must stop making wars and instead cooperate for the conditions of human life. 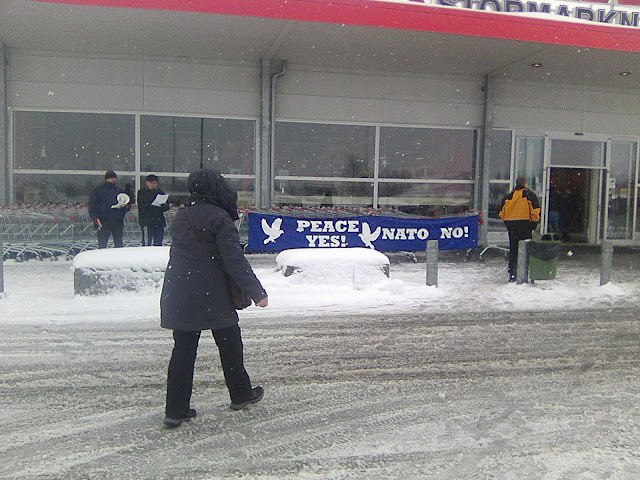 Today three of us from the Peace Committee in Lapland were in Haparanda, Sweden - because there is starting a war exercise (Northern Wind March 18th - March 27) with 10,000 soldiers on the ground plus a very large fighter exercise over both half of Sweden and a part of Finnish Lapland which will last until March 27th. I send you the text we both talked through megaphone and gave as flyers to people - in three languages - Swedish, Finnish and English. I send you the English one so you have some idea of what is happening here. All the time. More and more. Step by step.